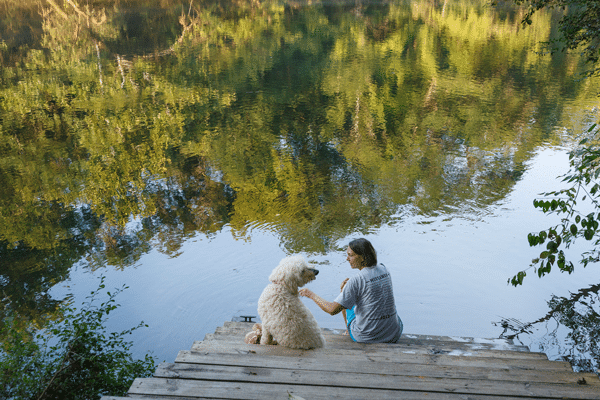 The many dog lovers and their fabulous four-legged friends who call Saluda River Club home appreciate the community’s well-kept dog park – located right on the river banks of the Saluda. It is important for dogs of all sizes to have a safe and fun place where they can run and play and do the things dogs are bred to do – every day. All dogs (and their owners!) need to exercise and socialize, and our fenced dog park is a popular gathering spot for the many dogs and their families who live in Saluda River Club. The dog park in Lexington, South Carolina offers water for the dogs, stocked waste bags and a generous space for the pets to run around and explore. The dog park is surrounded by tall trees and some comfortable benches for the dog lovers, who enjoy watching their dogs play while catching up with their neighbors and making new friends. Saluda River Club’s dog park is just one of the many thoughtful amenities included in our master-planned community. Having the dog park as well as the extensive system of walking trails throughout Saluda River Club makes this a great place where people and their pets are encouraged and inspired every day to live an active and healthy life. To learn more about the dog park and the many other amenities that are part of Saluda River Club, please schedule a visit soon. For more information or directions, please call 803-358-3969 or visitwww.saludariverclub.com.